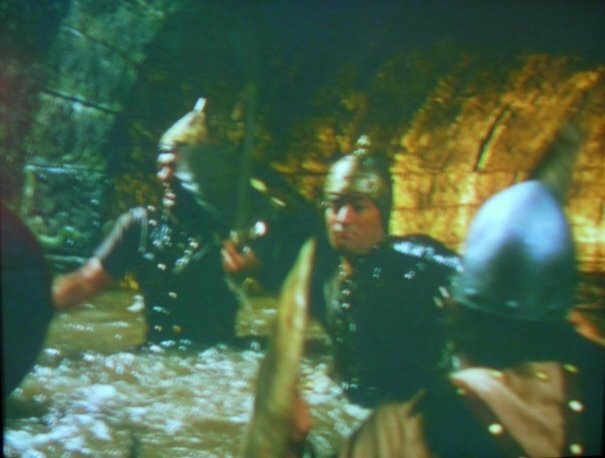 Generally speaking, Bible films from the (second) golden era of the 50s and 60s were all about spectacle. It didn't matter if the dialogue was corny, and the characterisations were fairly thin, so long as the film looked sumptuous, and re-affirmed Christian America that the values they cherished were all related to the bible. There were a few notable exceptions of course; films that probed a bit deeper, and were more challenging than campy classics such as Samson and Delilah. But few films were prepared to eschew scenes of huge battles and debauched orgies to focus on the stories at hand. 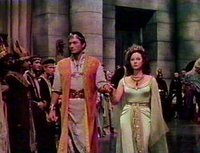 In that sense then, David and Bathsheba (1951), starring Gregory Peck and Susan Hayward, is distinctly different. Admittedly the film is bracketed by the briefest of fights, and does contain a seemingly out of place exotic dancer scene, but both of these play a notable part in the psychological exploration that the film lays before us. Initially, Peck's David seems to be a disappointment. As usual, Peck is attractive, heroic, and yet emotionally guarded. The result is a David that lacks the passion of the famed psalmist, or of the unwavering confidence of the shepherd boy who slew a giant. In fact, the first time viewer may wonder if this is going too be the most secular bible film ever produced. Is it simply an excuse to bring together two of Hollywood's handsomest actors? Thankfully, there is far more going on here. 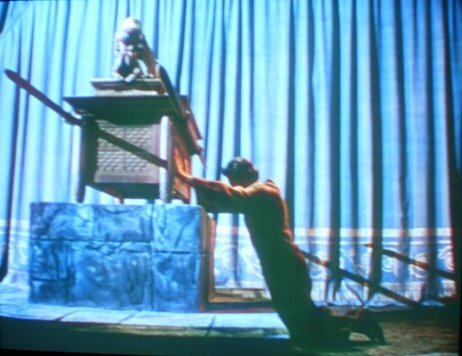 The low key portrayal of faith in the first part of the film reflects not a lack of interest on the part of director Henry King, but David's estrangement from the faith of his childhood. His responsibilities, his loveless marriages, the death of his best friend, and no doubt his time fleeing Saul have blunted his relationship with God, and left him feeling distant from him. His early incursion into enemy territory betrays an internal crisis as he strives for the life of excitement he has left behind. Visually his old life in the open countryside is contrasted with his new life trapped in his new place of work, the palace. It's no surprise then that he first spies Bathsheba when taking in the fresh breeze afforded by the roof of his palace, nor that their relationship only really becomes emotionally intimate when they escape to the country. Indeed thematically, Bathsheba is, indirectly, his route back to God. That is not to say that their relationship is bathed in glory. 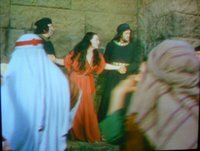 The film shows both David and Bathsheba as culpable for both their adultery and for the subsequent death of Bathsheba's husband Uriah. In an era when often film-makers attempted to redeem biblical characters and turn the story around, so that even Salome was dancing to save John the Baptist, it is happy to popularise the weakness of one of the Hebrew bible's favourite heroes. Nevertheless, it does soften the blow somewhat. Whilst David wastes no time in getting acquainted with Bathsheba, we learn it is she who had deliberately put herself in his view. Furthermore Uriah is painted as a criminally disinterested husband, spending only 6 nights with his wife in 7 months, and refusing to visit her when he is strongly encouraged to by his hero David. Even the exotic dancer mentioned above fails to stir in him a great deal of interest. Furthermore, David's fatal instructions to Joab are, to a great extent, based on Uriah's own wishes and martyr complex. As David observes "His dreams of glory are his wife in tears". As with the biblical accounts, David and Bathsheba's adultery leads to God's judgement, the subsequent death of their child, and their exposure by the prophet Nathan (although as the scene guide shows these two incidents are in reverse order here compared to the scriptural account). The result is that the people recognise that the drought they have been suffering is a result of David and Bathsheba's sin and they are eager to punish them according to the law. David meanwhile has been forced by Bathsheba to glimpse into his past and re-enact his relationship with God. His performance of Psalm 23 is strangely emotionless and stoic. Yet as it ends on "and I will dwell in the house of the Lord forever" it is like something clicks inside David and he returns, not to face the people inside the city but to face God in the tabernacle which remains outside it. Therein, David both confesses his weakness, but also pleads with God for mercy - mercy which has been in little supply so far. Earlier David was clearly deeply disturbed by the death of Uzzah as he reached out to prevent the ark from falling. Yet now his plea culminates in him repeating the action, forcing God to decide whether to continue as he did previously, or become more merciful. What is remarkable about the film is that God responds to David's almost suicidal attempt to receive God's mercy. As David touches the ark, lightening strikes and David's life flashes before his eyes, yet this is not David's death by electrocution, but his resuscitation. As Babington and Evans note "David has moved God by his superior perception of him to a phase of higher activity". The trip into David's youth complete, David's release from his spiritual drought is mirrored by Israel's release from their physical drought as the rain finally pours down declaring David's forgiveness to his subjects. It is noticeable that whilst David and Bathsheba is primarily a biblical epic it also touches on a variety of other genres and other films in particular. Most notably the film recalls another Peck film, the psychoanalytical thriller, Spellbound (1945) by Alfred Hitchcock. There, Peck's character is emotionally estranged, partly as a result of the death of his actual brother. There to the film culminates in a revelation of the past which provides drive and direction for the future as it restores the hero to wholeness. Yet the film also reflects genre's such as Film Noir (Bathsheba as a femme fatale, the murder of a husband, a cover up, and the dark brooding interiors), and Romance (especially the picnic scene in the countryside). Modern viewers may also find some points of comparison with the recent Brokeback Mountain with it's tale of a forbidden love found in an unlikely place that goes far beyond the depth of relationship the film's protagonists are able to find elsewhere. In both films the lead characters are driven to more desperate actions due to the unbearable pressure the wider society puts upon them. The notable difference is that both David and Bathsheba recognise that they have crossed a line in their adultery. Ultimately however, the film seems to support David's scepticism and unease with the current revelation of God, and points to a future, greater revelation of God in the form of one of David's descendants. Most notably this is highlighted in a scene where an adulteress (dressed appropriately in red) is stoned, very much in the style of John 8:2-11. Yet here there is no reprieve, David is compromised and does not intervene even though the audience's familiarity with the Johannine story makes his inaction unbearable. The tension created by this scene, occurring as it does so shortly after the equalling troubling death of Uzzah, forms the question that dominate the film. Is God forgiving and merciful? Whilst its final resolution gives an emphatic yes, it also points beyond this story to the greater act of love and forgiveness that was to come. What is interesting about the film is the way that, unlike "The Ten Commandments", it carefully maintains a somewhat "agnostic" attitude: it allows a viewer to give a non-supernatural interpretation of certain events, if they prefer. For example, I think that David himself questions whether Uzza was really struck down by God for touching the ark - he may just have died of natural causes, brought on when the Ark seemed to be toppling over and he rushed to save it. And so later, when David himself touches the Ark, his survival may not be due to any special divine dispensation at all - it may just be a box. Similarly, the lightening that flashes in this scene may signal a divine communication - or simply be a natural phenomenon connected with the storm that will ultimately bring the longed for rain - a storm that was clearly brewing even before David entered the tabernacle. Thanks for bringing that up. I'd not really thought about the end fo the film in that way, although I considered mentioning the discussion that occurs early in the film about David's slaying of Goliath. David suggests that Goliath grows a little more each time he retells the story, suggesting the incredible nature of it is mythical rather than factual, and that the version we have today is not how it really happened. Interestingly though, when we see the event as a flashback, the man is clearly a giant, suggesting that the biblical account is actually correct but that it's David's perception of God that is shrinking. As such it follows the same trajectory as other Biblical epics which voice the secular accounts of their "miracles", only to rebuff them - e.g. Ramsees' explanations for the plagues are "disproved". I'm not sure whether this impacts on the reading you're suggesting. I suppose I thin it does and that it should be used to dismiss the other question marks as to the activity of God in the film. But then I'm a believer so I suppose that's not a big surprise, A non-believer would probably dispute my interpretation in this respect.